The highest peak in the entire African continent and the tallest free-standing mountain in the world. Mount Kilimanjaro. So much more than just being the highest peak in the entire African continent AND the tallest free-standing mountain in the world. For many, it represents the ultimate once-in-a-lifetime personal challenge - an arduous but highly rewarding 5 to 8 day trek up to Uhuru Point (the actual summit) or to Gillman's Point (on the lip of the crater). The famous snow-covered peak of Kilimanjaro towers an impressive 5,895 metres (19,336 feet) above the African plains below. It is situated within the Kilimanjaro National Park, a UNESCO World Heritage Site, and is about a 130 km drive from Arusha. The slopes are covered with a variety of vegetation, starting with dense tropical forests at the base, which are inhabited by elephant, leopard, buffalo, the endangered Abbot’s duiker, and other small antelope and primates. Further up, the vegetation changes to moorland, covered with heathers. When you reach 4,000 metres, the alpine desert landscape begins, and extreme temperature fluctuations means that very little in terms of plant and wildlife can survive here, with the exception of a few hardy mosses and lichens. And finally, the desert turns into a winter scene of snow and ice - and before you know it, you are at the summit, looking out over the world. Since the summit of Kilimanjaro was first reached by the German geographer Hans Meyer and Austrian mountain climber Ludwig Purtscheller on 5th October 1889, literally thousands of people have succeeded in, or have attempted. the very same feat. It is estimated that today, a staggering 25,000 people a year set off on the journey. There are 5 main routes up to the summit: Marangu, Machame, Rongai, Lemosho and Umbwe. You can pick the route that you think is best suited to you, and also the one that will give you exactly what you personally want to get out of your trek. Your accommodation will be tents, which are carried up by porters, but if you don't fancy sleeping under canvas, then you should definitely choose the Marangu Route, as this is the only route where you sleep in dormitory style huts. All climbs have to be pre-booked, so you cannot just turn up on a whim and hope to start your climb that day or the next. There are many excellent operators that you can pre-book with, who offer either pre-arranged treks on given dates with groups up to about 8-12 people (for safety reasons), or you can arrange a private trek with your own guide (minimum 2 people). 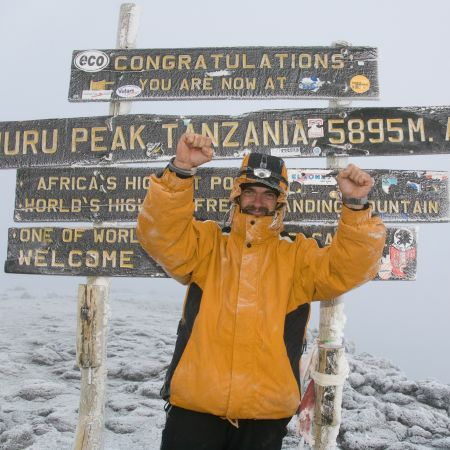 Obviously, it goes without saying that a reasonable level of fitness is required to climb Kilimanjaro, and most operators request that you consult your doctor to be given the 'all-clear' to climb prior to booking your trip. The best months to climb Kilimanjaro are from January to mid-March and June to October, as these are the dry seasons.